What is the difference? Well, really, like most things, the difference is in the details. While every skydive utilizes a parachute, parachuting does not always involve a skydive. Parachuting is employing the use of a parachute as a means to control the speed of descent from various altitudes to the Earth. Typically, the term ‘parachuting’ is used when the parachute has been deployed either immediately upon exiting an air craft or within 3 to 5 seconds of exiting an aircraft. So, an easy way to differentiate between parachuting and skydiving is to think of parachuting as a focus on the flight of the parachute (also known as the canopy) and skydiving as a focus on the flight of the body. Parachuting technology was primarily utilized and developed by the military. Initially, parachutes were a way for artillery observers to ‘evacuate’ tethered observations balloons. Later on, as technology improved, parachutes were a means to deliver soldiers and necessary cargo behind enemy lines. Typically, the parachutes utilized in military operations then and now are extracted by a static line system. With the use of a static line, there is no ‘freefall.’ A static line is a cord attached at one end to the aircraft and at the other end to the deployment bag which contains the parachute. As the jumper exits the aircraft, the static line becomes taut and pulls the deployment bag out of the container on the jumper’s back. The deployment bag stays attached to the cord, and free of the deployment bag, the parachute inflates. Back in the old days, parachuting employed the use of round parachutes. These round parachutes only slowed descent and were not responsive to directional inputs. But, lucky for the sport, improved RAM-air canopies, which create lift and are far more maneuverable, were developed. During a skydive, the body freefalls and reaches terminal velocity. Because of this, it helps to think of modern day skydiving as different than parachuting because the focus is on body flight rather than the parachute. Skydiving came about as something done for fun rather than for military operation. Pretty quickly, those early skydivers discovered that people could fly their bodies in multiple ways in freefall. This opened up a whole new world, and several skydiving ‘disciplines’ have since emerged. Individuals can fly their bodies relative to the ground (stomach to earth) creating shapes and formations in what is called formation skydiving or relative work. Some jumpers prefer to operate on an alternative axis and ‘freefly’, which, simply put, is flying in orientations other than belly to earth (think feet to earth or even head to earth!) There are even quite a few jumpers who cover pretty impressive distances horizontally with the use of wingsuits or at an angle with just their bodies. 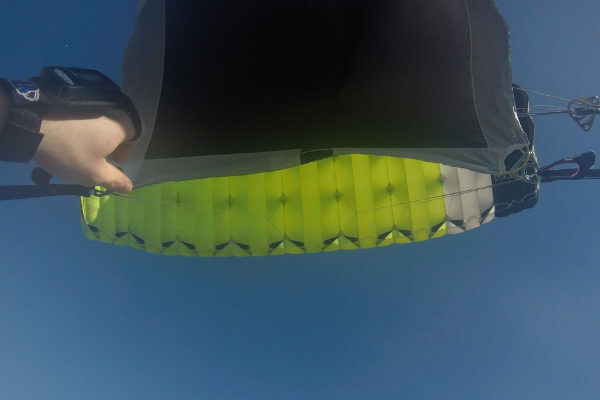 Skydiving and parachuting are inextricably connected, and the improvements in parachuting technology are what paved the way for skydiving as we know it today. And whether its parachuting or skydiving, really, in the sky, there is something for everyone to enjoy!